If Antarctic icebergs could talk, they would have epic stories to tell: calving, colliding, breaking apart, and drifting thousands of miles across the ocean. 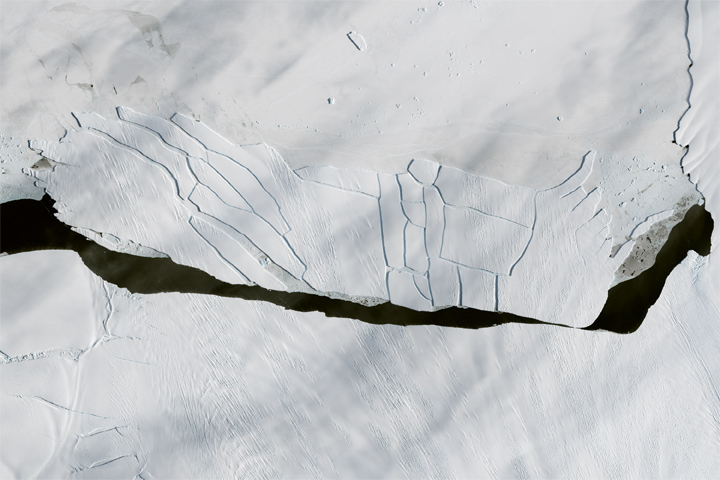 Since they don't talk, scientists rely on satellites to piece together the life stories of icebergs, some of which have been adrift for decades. Four icebergs of various sizes and ages are visible in this image of the Southern Ocean, near the Weddell Sea (south) and the Drake Passage (north). It was acquired on October 20, 2017, by the Moderate Resolution Imaging Spectroradiometer (MODIS) on NASA’s Aqua satellite. 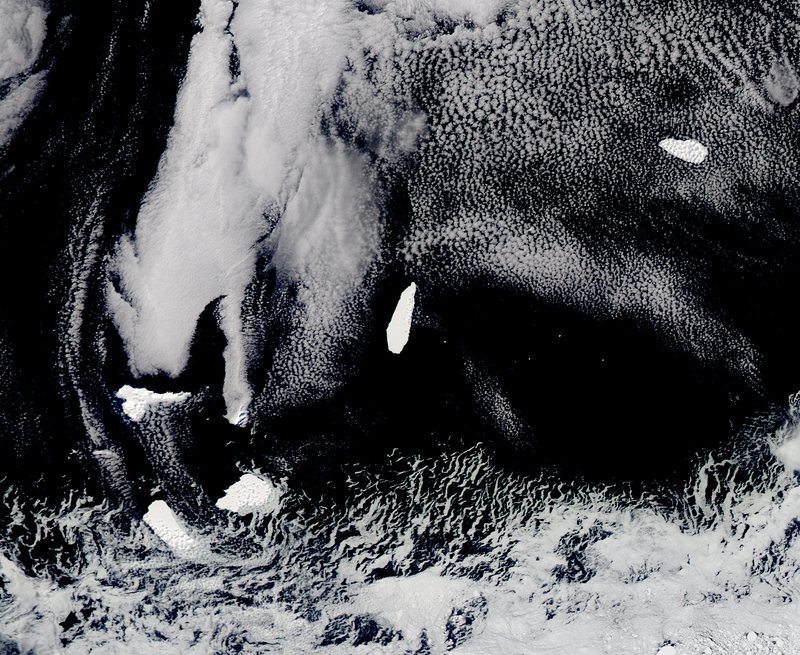 The fifth white feature in the image looks like an iceberg but is, in fact, a piece of land—Elephant Island—buried under snow and ice. Icebergs are named based on the quadrant of Antarctica from which they calve. Most of the icebergs in this image—those that start with a ‘B’—come from the Ross Sea area and have drifted counter-clockwise around the continent. “A wicked cool part of the story is that this was a long trip for these bergs,” said Kelly Brunt, a glaciologist at NASA's Goddard Space Flight Center. Iceberg B-09F is a fragment that broke from B-9 iceberg, which calved in 1987 from the Ross Ice Shelf in West Antarctica. It took the massive iceberg more than two decades to drift out of the Ross Sea and along the coast to the Mertz Glacier in East Antarctica. 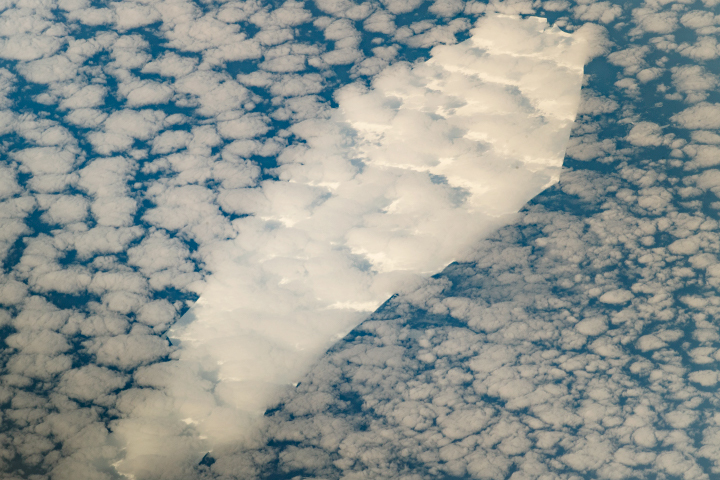 Along the way, it broke apart, and one segment became B-09B (not pictured), which in turn collided with the floating tongue of Mertz Glacier in February 2010 and formed the C-28 iceberg. C-28 subsequently broke apart into pieces including C-28B, pictured here. 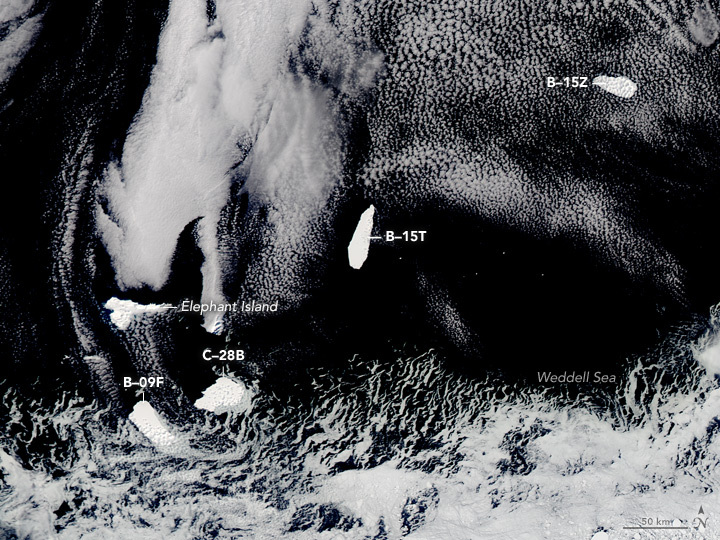 The two other icebergs pictured—B-15T and B15Z—broke from B-15, the largest iceberg ever measured with satellite imagery, according to Brunt. 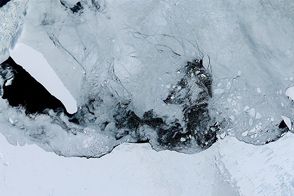 When that berg calved from the Ross Ice Shelf in March 2000, it was almost as large as the state of Connecticut. 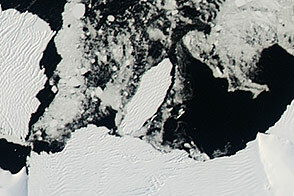 The icebergs in this image were carried to their present location by a combination of ocean currents: the coastal countercurrent, which flows counterclockwise close to Antarctica; and the Weddell Sea Gyre, which spins clockwise and pushes the bergs in the western Weddell Sea to the north. As they continue to drift north, these bergs will probably get kicked back toward the east as they encounter the powerful Antarctic Circumpolar Current funneling through the Drake Passage. 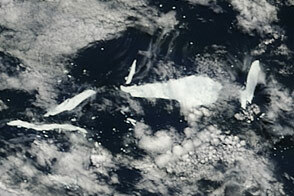 “The Drake keeps these bergs from continuing counter-clockwise around the continent,” Brunt said. From that point, icebergs quickly whip north toward the equator and rapidly melt. 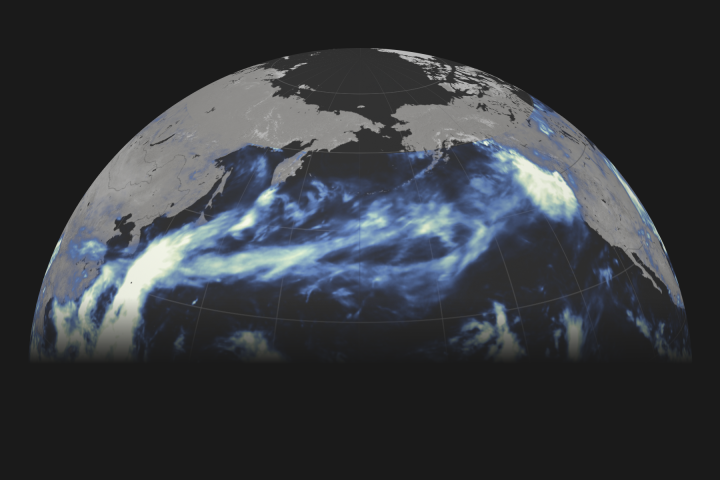 NASA image by Jeff Schmaltz, LANCE/EOSDIS Rapid Response. Story by Kathryn Hansen. Scientists rely on satellites to piece together the life stories of icebergs from Antarctica, some of which have been adrift for decades. U.S. National Ice Center (2017, October) Products. Accessed October 24, 2017.